KYOSHI PATRICK McCARTHY. Interview By DJ Lamberton. Karate and Adaption. By Dr Farid B. Amin. Stages of Technique. By Avi Rokah. 'Feel the Energy'. By John Cheetham. MASAO KAGAWA visits U.S.A. Report By Kyle Kamal Helou. Where to find your KARATE-DO. By Mike Clarke. MANABU MURAKAMI: A master in the making. By Gerry Karantzas. When I first read the report on Kagawa sensei's first visit to the U.S.A. earlier this year, I thought, "Oh! Good report but we've heard all that before." Then I read it again and suddenly realised that, "Yes! I must publish this report in the magazine." Why? Because of the message it gets across. It doesn't matter what grade or rank you are or how long you have been training, the jist of what Kagawa was teaching says it all; namely, we should all strive to develop techniques with maximum efficiency and effect and deliver them with minimum effort! Without a thorough understanding of the principles and efficient ability in basic technique (kihon), your karate is zero! You may be fairly effective through strength, size, speed or athleticism but this is not the 'ART' of karate and I doubt many people reading this are in the same league 'technically' as Kagawa, who ranks alongside the great technicians of Shotokan karate from Yoshitaka Funakoshi onwards. So, it's important to get across to new (and not so new) students of Shotokan, how vital trying to master basic technique is, and understanding the basic principles, and that is primarily why the report is included (apart from being a good read). I know for a fact that where certain 'kicking' techniques are concerned, there is definitely, undoubtedly a certain amount of 'showbiz' but in Kagawa's case, it's forgivable. However, it's the simple, basic principles that he tries to pass-on that is paramount in his teaching. You find that all the top instructors have their own little 'party tricks'. Who cares? We desperately need instructors of this level and ability because karate is endlessly being watered down. These people, Kagawa, McCarthy, Murakami, Avi Rokah etc., are the future 'Masters' who can pass-on the ART of karate and not just an athletic version. One of the main reasons I published this 'no holds barred' interview with Patrick McCarthy, is because it emphasises the vitally important issue of the teaching and instructional 'STANDARDS' in karate-do, and indeed the martial arts in general worldwide. There are massive disparities in teaching standards as I'm sure you are all aware! 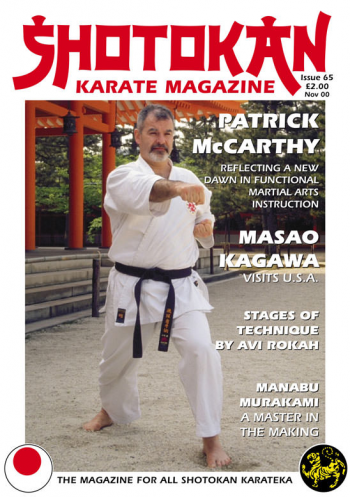 Avi Rokah's article is highly technical and needs studying very carefully; this is deep, advanced karate training. Avi's descriptions go way beyond athletic movement, this is how to move from the body's centre; how to co-ordinate your breathing, stomach muscles and pressure to the floor; making the body like a spring! I'm not biased and I appreciate 'all' good martial arts but I have to say this: Did you see Taekwando in the Olympics? Was that the most embarrassing pile of unadulterated rubbish you have ever seen, or what? What must the public think after watching this dreadful excuse for a sport? It was like watching two beginners sparring, endlessly kicking each other up the backside! No tactics, strategy, no blocking (defence), no concept of timing! (Cringe, cringe)! We must continue to try and get karate into the Olympics to at least let the public see something resembling karate! Twenty years ago Taekwando was a martial art, what we saw here was a sad sport! I'm dismayed!